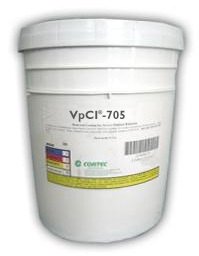 Cortec VpCI-705 is specially formulated for use as a multi-functional fuel additive. It serves as a corrosion inhibitor, fuel stabilizer, and water emulsifier for gasoline, diesel, and gasohol mixtures. VpCI-705 provides corrosion protection, lubricity, and elastomer protection. As a fuel stabilizer, this product provides better engine performance. In-use gasoline tanks: Add VpCI-705 to gasoline or diesel fuel, fuel blending and storage facilities, or directly to fuel tanks. Dosage: 0.1 - 0.15% per volume of tank to be protected. Sales Gas and Gas-Condensate lines: Inject VpCI-705 at the dosage rate of 1/4 to 1/2 pint per million cubic feet of gas. Treatment of liquid gas tanks: Treatment ranges from 100-200 ppm and depends on liquid gas chemistry and CO2 /H2S content. 5 gallon pail (Cortec Product #12102817) - Shipping Weight: 50 lbs. 55 gallon drum (Cortect Product #12102818) - Shipping Weight 500 lbs.